MEIGS COUNTY — Jordan D. Pickens of Pomeroy was installed as Master of Harrisonville Masonic Lodge No.411 on Saturday, Dec. 1, at Harrisonville Masonic Lodge. Pickens is also an active member in Middleport Lodge No. 363 as well as Pomeroy Chapter No. 80 Royal Arch Masons, Bosworth Council of Royal and Select Masons No. 46, Ohio Valley Commandery of Knights Templar No. 24, Racine Chapter No 134 Order of Eastern Star, and the Valleys of Gallipolis and Cambridge Scottish Rite Masons. 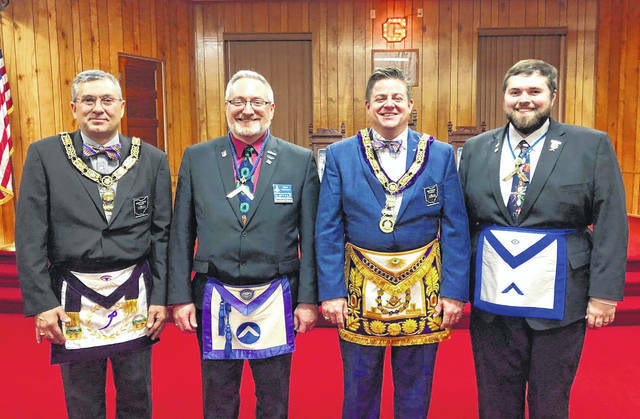 Outside of Freemasonry, Pickens is a member of Nelsonville’s Valley Lodge No. 169 Knights of Pythias and is a member in the Honorable Order of Kentucky Colonels. He teaches American History at Southern High School, where he is a 2009 alumnus and a 2014 graduate of The University of Rio Grande. Worshipful Master Pickens was installed by Right Worshipful Master Donald Stivers, Past District Deputy Grand Master of the 12th Masonic District (Meigs, Gallia, Lawrence and Jackson Counties) Past Master of Middleport Lodge No. 363 and Past Master of Shade River Lodge No. 456. Other installing officers for the evening included Illustrious Brother Ivan M. Tribe, Installing Marshall. Illustrious Brother Tribe is a 33rd degree Scottish Rite Mason and a Past Master of Albany Lodge No. 723. Worshipful Brother Guy Bing II served as Installing Secretary. Worshipful Brother Bing is the current District Education Officer for the 12th Masonic District and he is a Past Master of Middleport Lodge No. 363. Worshipful Brother Gary Coleman served as Installing Chaplain. Worshipful Brother Gary Coleman is the Worshipful Master of Middleport Lodge No. 363. Other officers installed for Harrisonville No. 411 for the 2019 Masonic year include WB Glen Kennedy, Senior Warden; WB Glen Brown, Junior Warden; Bro. Jesse Pullins, Treasurer; WB Harry Roush Jr., Secretary; WB Larry Well, Chaplain; RWB Jerry Well, Senior Deacon and Lodge Education Officer; Bro. Jayson Tillis, Junior Deacon; WB Charles D. Wilson, Senior Steward; WB Roger S. Gibson, Junior Steward; WB Ron Casto, Tyler. Gary A. Coleman of Middleport was installed as Master of Middleport Masonic Lodge No. 363 on Tuesday, Dec. 4, by the Grand Master of Masons in Ohio, Jess N. Raines. Coleman is also an active member of Shade River Lodge No. 453 in Chester, Pomeroy Chapter #80 of Royal Arch Masons, Bosworth Council #46 of Royal and Select Masons, Ohio Valley Commandery #24 of Knights Templar, and the Valley of Cambridge Ancient Accepted Scottish Rite. He served as the 2018 Grand Photographer for the Grand Council of Royal and Select Masons of Ohio and has been asked to serve as the 2021 Grand Photographer for the Grand Commandery of Knights Templar of Ohio. Coleman enjoys spending time with his family, photography, and genealogy in his free time, is a member of the Meigs County Bicentennial Committee, and is part of the management team at Kroger in Ripley, W.Va.
Worshipful Master Coleman was installed by Most Worshipful Grand Master Jess N Raines, Grand Master of Masons of the State of Ohio. Other installing officers for the evening included Worshipful Brother Larry Byer, Installing Marshall. Worshipful Brother Byer is a Past Master of Middleport Lodge No. 363. Worshipful Brother Jeffery Peckham served as Installing Secretary. Worshipful Brother Peckham is a Past Master of Middleport Lodge No. 363. Worshipful Brother Roger Winebrenner served as Installing Chaplain. Worshipful Brother Winebrenner is a Past Master of Middleport Lodge No. 363. Other Middleport Lodge Officers installed for the upcoming year were: Jordan Pickens, Senior Warden; Jeff Warner, Junior Warden; Guy E. Bing II, Secretary; Jeff Fields, Treasurer; Don Stivers, Chaplain and LEO; Ken Barnett, Senior Deacon; Raymond Cotterill, Junior Deacon; Ed Neutzling, Senior Steward; Larry Coleman, Junior Steward; and Billy Goble, Tyler. As a fraternal organization, Freemasonry unites men of good character who, though of different religious, ethnic or social backgrounds, share a belief in the fatherhood of God and the brotherhood of mankind. Charity is an important tenet of the Masonic fraternity. The Freemasons in Ohio provide approximately $15 million in charitable giving annually, including college scholarships, support of the Special Olympics Ohio Summer Games, and free training for Ohio school teachers to recognize students at non-academic risk. General information is available at www.freemason.com. For local information, contact Gary Coleman at Middleport Lodge No. 363 at (740) 416-1722 or Jordan Pickens at Harrisonville Lodge No. 411 at (740) 416-9667.